In 2008 I decided to erect an observatory. After some research I decided to opt for a SkyPod These are manufactured in Canada and imported to the UK by Altair Astro in Norwich. The first stage of the installation requires the preparation of the ground and the foundations for the pier to support the telescope. For this I dug a hole about a metre deep and a metre across, like an inverse stepped cone. Here is a picture of the hole. Around this I built the frame for a deck to go around the pier. 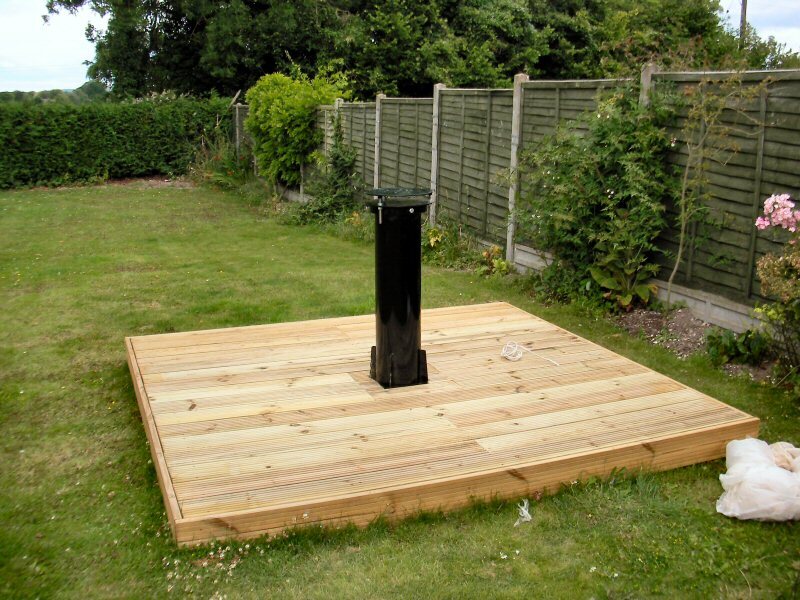 This used 4"x4" posts concreted in the ground to support a frame made from 4"x2" timber. This is shown in the image. The grass beneath was sprayed with sodium chlorate to kill it off and then covered in weed repellent fabric. 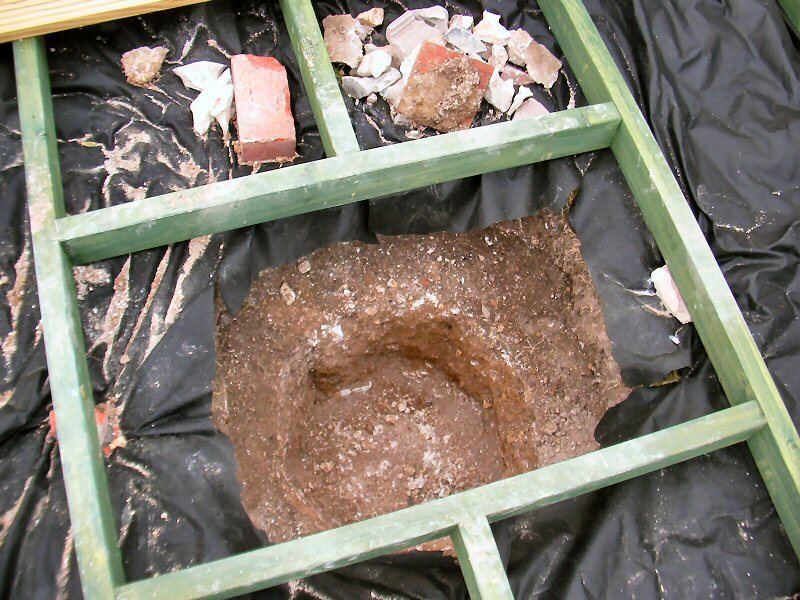 The hole was then filled with concrete. I did this by first casting about 30cms in the bottom and embedding in this three vertical wooden battens. These were cut to length so that the tops were level with where the base of the pier would be. 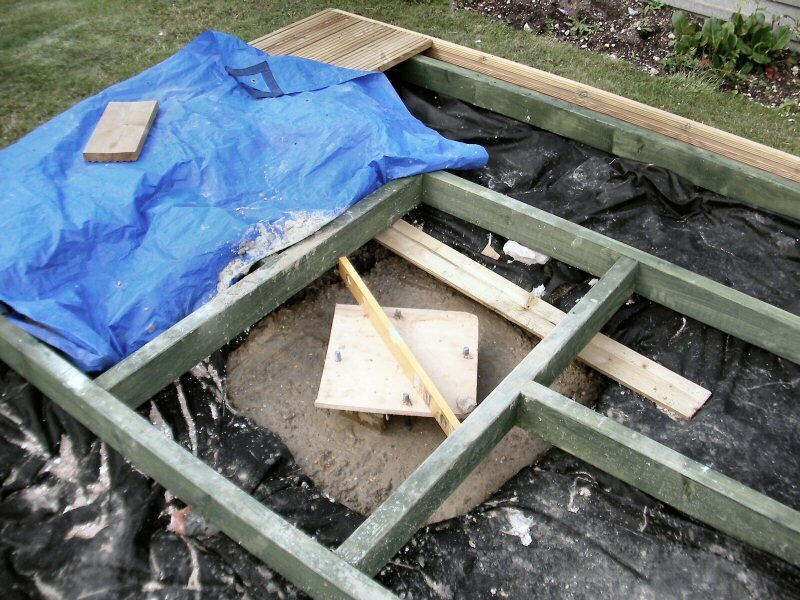 Once this had set, further concrete was added until about 20cms from the top of the battens. At this stage the four J bolts need to be cast in the concrete - these have threaded ends to which the pier will be bolted. To set these in the correct position I made a wooden template from MDF and fixed the bolts at the correct spacing. 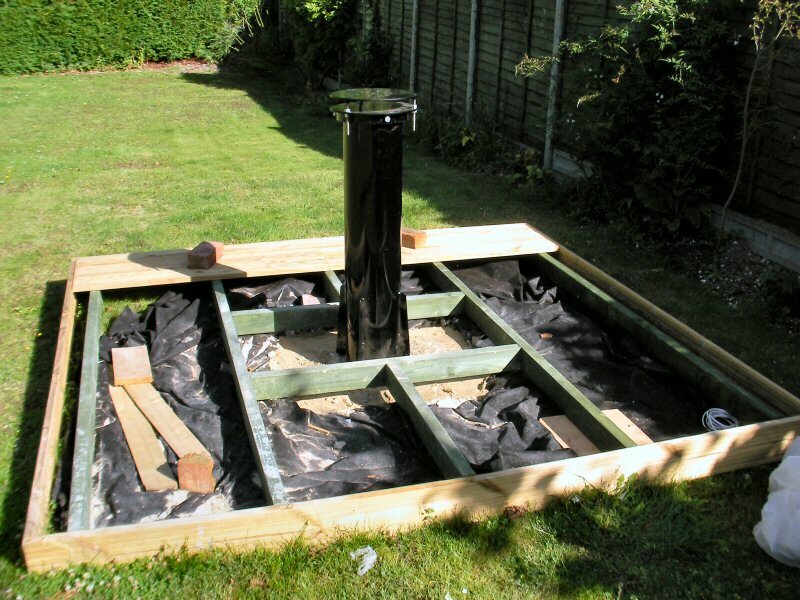 Further concrete was poured in the hole to the top of the battens and the MDF template with J bolts pressed in place. The level was checked with a spirit level (see image). This is then left for the concrete to set hard - at least 3 days (and covered if rain is expected). 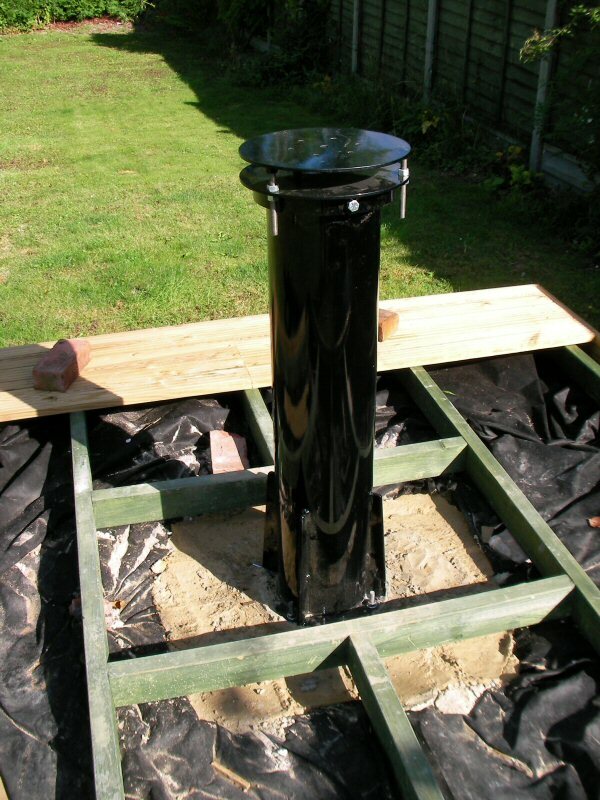 I bought a pier from Altair Astro that has a levelling table at the top, thus overcoming the need to get the pier absolutely vertical to optical standards (something that would be very difficult to do) - but it is fairly easy to get within a degree of the vertical. More information on these piers can be found here. Next the MDF template can be removed and the pier set in position on the protruding threads of the 4 J bolts. I mixed up some wet cement and put a layer about 5mm thick across the top of the cast concrete before setting the pier in position. This allowed me to set the pier in position and check it was level (with the wet cement I had a chance to adjust the level slightly). I then left it for 2 days for the cement to set before tightly bolting down, inserting washers between the nuts and the flange in the pier. I then wound some cling-film on the protruding nuts and bolts to protect them. I then decided to pour some more concrete over the flange of the pier, burying it about 75mm deep. I felt this would further stabilise the pier. This was still below the level of the deck and carefully designed not to foul the deck framework. The six wall panels connected together very easily. Assembling the secondary dome - yes and more sealant ! 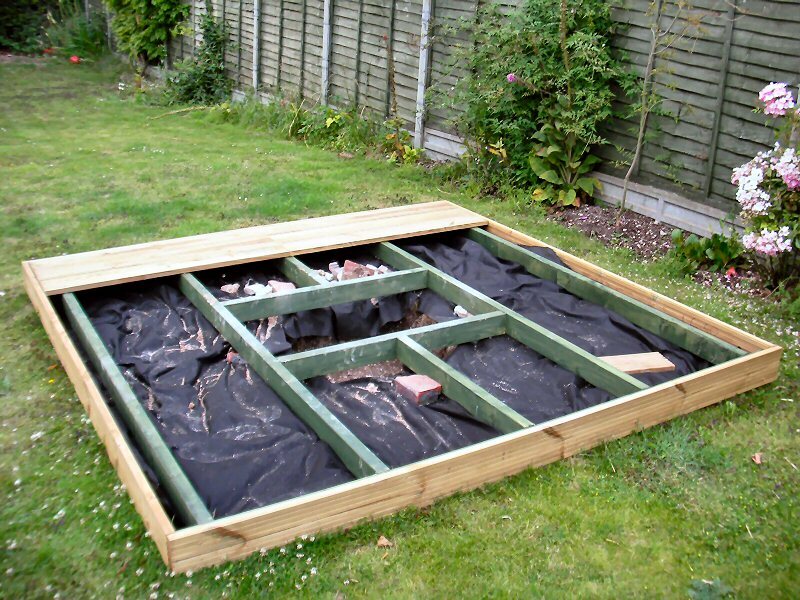 By the end of that day my wife Anne and I had it up and finished in the garden. The result, some 5 hours later ! Then finally the Observatory with my LX200 scope installed.